She is deeply engaged in social impact work and serves as an advisor to the US Fund for UNICEF. She also regularly engages with students across the country and was a Visiting Fellow at the University of Pennsylvania’s Wharton Public Policy Institute. She was named a David E. Rockefeller Fellow at the Trilateral Commission and a Millennium Fellow at the Atlantic Council. 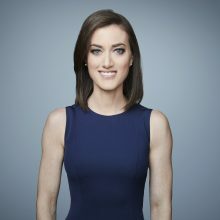 She writes a weekly column on cnn.com (the Presidential Weekly Briefing) and has published in several outlets including the New York Times, Washington Post, Newsweek, Daily Beast, USA Today, Harper’s Bazaar, Politico, and Marie Claire. Ms. Vinograd is fluent in French and studied advanced Arabic and Hebrew. She received her B.A. in Asian and Middle Eastern Studies from the University of Pennsylvania and her M.A. in Security Studies from Georgetown University.